Brand new to the Inova range, this 3ft single Inova black metal bed frame is perfect for any guest or child’s single bedroom. 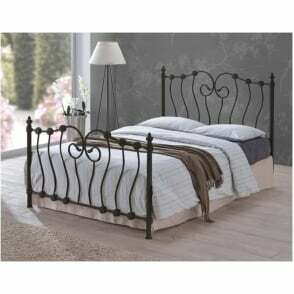 Featuring an ornate design, which is not too over the top, this 3ft single bed frame would easily upgrade any existing UK standard 3ft single mattress. Alternatively we have a selection of low cost mattresses available via the drop down tab which are perfect to accompany this 3ft single Inova bed frame. Part of the Time Living range this 3ft Inova single bed frame features a stunning black metal finish, sprung slatted base and easy to assemble procedure. All of our Time Living beds, including this brand new Inova 3ft single black bed frame, come via free next day delivery service in flat pack form. Our Time Living INO3BLK Inova 3ft single black metal bed frame is covered via a manufacturer’s warranty for peace of mind.